Miss Bates loves a cross-class romance. Indeed, it is one of her most frequently-used review tags! Obviously, it is a trope that “works” better in historical fiction, but if The Great Gatsby is anything to go by and it is, then it has potential for contemporary romance. In historical romance, however, Miss Bates’s (and many other romance reviewers much wiser and more widely romance-read than she) favourite cross-class romances are Elizabeth Hoyt’s Raven and Leopard Princes. 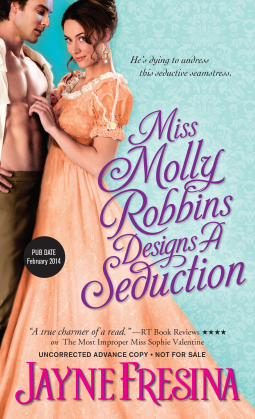 Miss Bates’s recent cross-class romance read was Jayne Fresina’s Miss Molly Robbins Designs A Seduction. Fresina’s effort has similarities to Hoyt’s, but not their mastery, the weakest link being the cross-class element. The ease with which this historical given is overcome puts the novel on the fluffy-wish-fulfillment shelf. On the scale of MissBatesian goodness of romance reading, it is middling. On the other hand, it is humourous and well-written and offers a likeable hero and heroine. Fresina’s Miss Molly is fourth in the Sydney Dovedale series, Sydney Dovedale being Miss Molly’s hometown. Miss Bates hasn’t read the others. There are snippets of confusion regarding the hero’s sister, Lady Danforthe, the heroine of book three, but overall you can enjoy this one without having read the others. Miss Molly Robbins, lady’s maid to Lady Danforthe, ex-fiancée to Rafe Hartley, Sydney Dovedale farmer, returns to London to fulfill a life-long dream of establishing a dress-making business. She needs money to do so and turns to Lady Danforthe’s dissipated older brother, Carver Danforthe, the Earl of Everscham, for a loan. The opening of Miss Molly put Miss B. in mind of Hoyt’s Raven Prince and its hard-working, capable heroine, Anna Wren. If Anna Wren is Edward de Raaf’s “little bird,” then Molly is Carver Danforthe’s “mouse,” as he is wont to call her. She is woebegone, wretched wet from rain, and thin as a rake as she sits, dripping, and asks him for a loan. He’s only returned in the wee hours from debauchery and she catches him at a “weak,” ahem-hung-over, moment when he agrees to it. Miss Bates must say that she had high hopes for this aristocrat’s dissipation … but can any romance author sustain such a hero for long? Make the hero skirt the edge of unacceptable? How to redeem him then? Fresina certainly doesn’t venture into this dangerous territory. And yet, Carver has such profligate potential; witness this moment after he agrees to the loan, ” ‘Well, Mouse,’ he’d slurred to her, grabbing a newel post to maintain a semi-perpendicular stance as he leaned over her.” Unfortunately, in no narrative time, our earl secretly acts as Miss Molly’s knight, ensuring her comfort and well-being, making her shop-apartment comfortable with warmth and good food, and sending her extra help under the guise of apprentices when her business succeeds. Fresina also endows Carver with the requisite bad childhood and lack of love to render him sympathetic. One of the ways in which romance writers cross the class divide vis-à-vis their lower-class heroines is with the compassion the heroines feel for the hero. Heroines feel sorry for the hero. The hero is lacking in love, even while he is more powerful in every way, socially, economically, physically. Certainly, this is what inspires Fresina’s heroine, Margaret “Molly,” a lady of puritanical bent, determined to save her virtue from depraved earls, despite her lowly status and subsequent vulnerability. Yet, she reaches out to Carver, “How lonely the earl had seemed to her … Between master and servant there should always be distance, but in that moment the space was breached.” Her heart is moved the moment he appears helpless, vulnerable, little-boy forlorn, in need of love, despite his money, land, and titles. Molly ensured, by including it as a proviso on their loan agreement, that Carver cannot breach her, that she maintain her dignity, all she has of it in her maiden’s status. He has so much more and yet is needier than she, less grounded and content. When they become lovers, one of the ways in which Fresina shows how they’re made new in love is in brushing aside social barriers, way too abruptly and easily Miss Bates says, in the names they use for each other. Carver calls Molly her full name, Margaret, no longer “Mouse,” or the servile “Molly.” She calls him “Danny,” endowing him with a little-boy’s name, deserving of love and coddling, what he never received from his parents. But the world is “too much with us,” and Margaret and Danny’s paradise is invaded by the snake of social convention, “She was still a dressmaker, and he was an earl. Their love could flourish only in shadow.” How that love is too easily brought to light is one of the novel’s flaws. Miss Bates calls it the “Burrowes Syndrome,” the dropping away of social barriers just so, historical romance-writing at its expedient best. Fresina wants to suggest that the cross-class nature of Carver and Molly’s relationship keeps them away from each other. Unfortunately, what she actually writes is Molly’s feelings of inferiority because she’s not beautiful … boring … and Carver’s dissipation and sense of worthlessness because of his harsh upbringing. Class is not the issue, just the unexplored premise. In the same way, Carver transforms from roué to philanthropist in a flash of the e-reader. And Molly’s drippy virtue gives way to vamp in no time. An aspect of characterization that was not terribly convincing. Humour and witty banter between the leads are Miss Molly‘s strengths. Molly and Carver, just as they point to the loveable in each other in their love-names, also poke fun at their weaknesses. Fresina writes good satire, poking fun at her characters: the indolent aristocrat and stiff, self-righteous virgin. Miss Bates chuckled over lines such as Molly’s contempt for Carver when she calls him, “the almighty Lord Sloth, Earl of Lazybones.” There’s a delicious peasant girl’s subversion in her name-calling, but Carver signals her puritanical sanctimoniousness with great lines such as, “her small face solemn as an undertaker” and Miss Bates’s favourite, “the burden of carrying that halo around must make her head hurt.” The romance took quite a long time to get off the ground and the narrative is plagued with not-terribly-interesting secondary characters, as well as a purposeless mystery plot, so the humour went a long way to helping Miss Bates get through the slow first half. Fresina, on the other hand, sure does the love between these two soft-hearted-with-tough-exteriors leads quite well, Carver’s in particular. There is no doubt, from the start, that Molly’s compassion, affection, and care for Carver conceal a girl hopelessly in love with a man in every way her better: wealth, position, looks, experience, education. When Carver falls, however, he is helpless before his feelings, “Carver now had this unconquerable idea that she belonged to him.” He doesn’t know how to express his feelings, or ask for emotional intimacy, so he aims for possession and protection, “He must do all in his power to take away all Molly’s other troubles and leave her free to have only one. Him.” It is a very lovely moment when Carver realizes that the greatest gift is love freely chosen and given, “With that one small gesture, he was lost and found all at the same time.” Well done, Ms Fresina. There is much to like about Miss Molly Robbins Designs A Seduction and the mouthful of a title is not it, nor the slow first half, nor expedient razing of class barriers, nor the narrative padding with secondary characters and tacked-on mystery plot. But there’s humour and late-to-the-game-but-lovely-nonetheless romance. Fresina’s romance novel is “almost pretty,” Northanger Abbey, because it never comes through on its promises: the cross-class element is easily dealt with, Carver’s drinking and carousing miraculously disappear, Molly’s prudishness melts away at a touch and carpe diem moment. But if you’re looking for a “light” read, you’ll enjoy Miss Molly and her aristo. Jayne Fresina’s Miss Molly Designs A Seduction has been available since Feb. 4th and may be acquired at your usual e-book/paper book seller. Miss Bates is grateful to Sourcebooks Casablanca for an e-galley, via Netgalley, in exchange for this honest review. Miss Bates is fascinated by the idea of her heroine’s feeling of compassion toward the hero. Have you read romance narratives that exhibit this on the part of their heroines?